Call it an epiphany, a revelation, finally seeing straight (which is really, really hard if you know me!) Doesn’t matter, but this post isn’t about how frustrating it is to work so hard and not to earn any money. It’s not about how frustrating it is to see stupid people read your books, thinking they know it all, and it’s not about how frustrating it is having to battle an increasing monopoly in book sales. No. There is this one frustration to rule them all, and I finally understood, yesterday. The cover for my new novel Last Winter’s Snow. The book releases April 6. We’re in the final stages of proofing the text. My most recent fiction publication happened in mid-September, with the release of the final book in the Jonathan Trilogy. That’s six months ago. 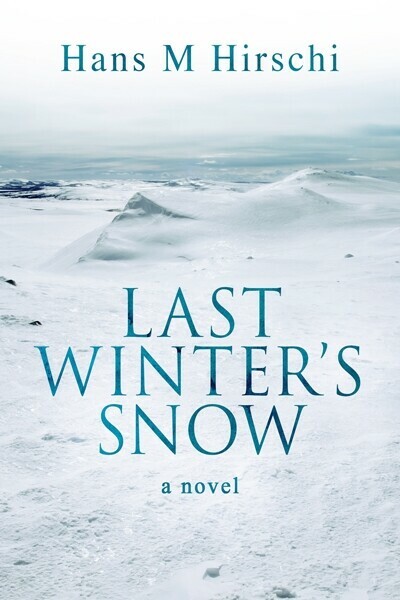 But it’s been almost eleven months since I began writing Last Winter’s Snow, the next book up for release in April. So much work! I’ve been talking to readers, my editors, proof readers, and publisher about it, we’ve been discussing the book’s title, theme, content, research, and I’m still at it, having just completed a final read-through before the galley is off to print, in time for the release. You build up this anticipation for a new release, you tease, release morsels of information, create a trailer, reveal (not release, Hans) the cover, panic over the edits, and slave hard to get the ARCs (Advance Review Copies, in case you’re unfamiliar with this particular publishing acronym) out in time to give reviewers time to read the book and review it in good time for the release. If you’re an author, you’ve undoubtedly been there, done that, and you have countless t-shirts hanging in your closet to commemorate every release. Then comes the big day, you send out the ARCs, and the waiting begins… 24 hours later, I had the first verdicts, and so far, they’re all very good. Do NOT misunderstand this. It’s not frustrating to get feedback, particularly not the positive kind I’ve seen. But it’s bloody frustrating when the feedback is encapsulated in a couple of sentences, a paragraph. Eleven months of hard labor, pouring your life’s blood into a story, investing a significant amount of money into research, covers, lots of people involved in getting things right, and all you get in return is a paragraph. Now, I am fully aware that I have no right to expect more. And yes, it could be so much worse. The paragraph could be a single short sentence: “I hated it!” This isn’t what this post is about. I do not, would not, ever expect more. And I have no clue how this feels for other authors out there. But I have little inhibitions to talk about this, and what I want more than anything else is to sit down with readers, to hear how they interact with the text, the characters, if they walk away with anything from the plot, if they like the characters, if they found any moral morsels to enrich their life. I want to talk about the book, the story. Eleven months of work. I love my characters, they are a part of me. And like a parent, I’m never really ready to let them go. They’re family, they all include a bit of my DNA, a bit of me (and no, don’t go looking for it). I love my characters, I am the father of each and every one of my characters. Letting go is the hardest thing, and I wish I’d get to spend more time with my literary “kids”. And all I get back is a sentence, a paragraph. I know I do not get to expect more, but it’s just bloody frustrating that eleven months are turned into five hours of reading and then it’s done, “I loved it!” and they move on to the next book, the next story, the next author’s life blood. Such are the rules of publishing, the plight of being an author. I have no right to complain. Doesn’t make it any easier, does it. There have been a few instances when a reader took a story to heart, made it their own, literally. They never shut up about it. Those are the few instances where I bask in the warmth of finally being able to share my feelings, my emotions around a book with someone else. When I released my first book, I had spent eleven months slaving away at it so I can understand your pain. My frustration wasn’t so much from beta readers but from friends and family. It felt like there was a lack of understanding at just how much of an achievement it was to finish writing the bloody thing. I look back and wonder if I was as dismissive of my friends who painted or wrote music. I worry I may have been. Unless you have gone through the process of creating something so personal, I think it hard to fully appreciate the type of emotional investment that goes into it. As corny as this sounds I think it made me a better person… I try now to be more supportive and less critical. Congratulations on all your hard work and best of luck for the upcoming release. I am looking forward to reading your book, and will do my best to leave a deserving review. I personally dislike the reviews that regurgitate the entire book. I just don’t understand the reasoning. Thank you so much for commenting Peggy. I hope this post didn’t come across as me begging for reviews. 🙂 I’ve stopped reading those a long time ago, unless they’re sent directly to me. I think some readers don’t like to read long reviews, but when I write one, perhaps because I’m aware of the work it goes into writing a book, perhaps because I want to make sure that people will find enough information to tell them if they might like the book or not (irrespective of what I think), I tend to write pretty detailed reviews, but not necessarily about the story of the book. On the other hand, I know that the demands on reviewers are many and writing a thoughtful review takes time that one feels one should be using reading the next book. (I want to read almost all the books people ask me to review but I’ll need to live several lives at the rate I’m going, to be able to manage). I’m sure I’ll have plenty to say about your book, Hans, and I hope to start reading it early next week. I find that people generally write what they “think” rather than how they “feel” …they actually don’t even consider sharing their feelings. Also, I agree, sadly, in terms of reviews, people many times are writing for other readers, not for the author, and they know, short is usually best. Lastly, I will mention .. some people go to work for a lifetime and produce the clothing we wear and the sports equipment we use, and they are actually passionate about that and probably never get feedback. So, at least you are getting something! I try to consider that when 1 out of 10 people decide to review my services. Its usually not personal, even tho, I so make it that way. It could be worse, you didn’t get a review at all. For better or worse, a lot of readers just don’t know how to review something at all. Either they don’t have a sufficient command of English to write something coherent, don’t have a credit card to get to review on Amazon (although they are allowed to review on goodreads as long as they sign up), or simply don’t have anything good to say. A lot of people will hate your book, but don’t feel compelled to be the bad guy and write an awful review. Other people just don’t know what to say even if they loved your work. I always write a review for the books I read and usually give out elements of the plot. Sometimes blurbs don’t give out the whole story and I want to mention the plot to potential customers without spoling the ending. I usually write two paragraph reviews, sometimes longer ones if I disliked the book. Maybe if more authors reviewed other people’s work, fellow authors would get better and more informed reviews that help both the writer improve their craft and customers to know if they will like the book or not.